Black gothic shrug bolero/short jacket from Dark Star made from silky fabric and stiffened at the front and around the neckline. 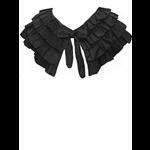 It has three-quarter length sleeves with a generous delicate frilled lace cuff. All edges are trimmed with heavy braid. 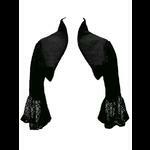 Very versatile and can be worn with dresses, sleeveless tops and corsets. 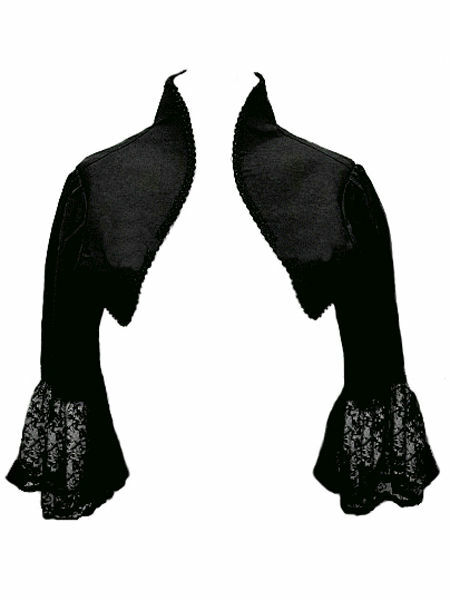 Sleeve Length from underarm: 13"
This gothic shrug/bolero is one one of a few purchased from the gothic catwalk. It is a gorgeous addition to any outfit. The fit is perfect and it is extremely comfortable to wear, an ideal item for Summer evenings. I am very pleased with this item.